A classic dessert turned cocktail, this Raspberry and Fuzzy Peach Melba will rock your summertime bar. It’s amazing what rum and fresh summer fruit can do! I’ve been visiting the grocery store lately to hoard a certain seasonal fruit. For me, the epitome of summer is signaled by the quantity and quality of peaches at the regular and farmer’s markets. I’m not picky, I love the yellow ones and the white ones. It’s hard to choose. I especially love making this Peach Coulis…it’s to die for. So, now that I’ve accumulated an abundance of peaches, it’s necessary to come up with ways to use them like Peach Lemonade, Peach Crisp or fresh Peach Ice Cream. One of my favorite desserts is the classic, Peach Melba, but I was feeling lazy. So, to make it easy on myself I made a cocktail. Good idea right? It’s a bit of a twist on the old Fuzzy Navel drink’s from college made with Peach Schnapps’s and orange juice. This is of course much more civilized and has lots of fruit, so let’s just call it a health drink for now! Here’s what you’ll need: Raspberries, spiced rum (who doesn’t have a bit of the Captain in the cupboard to use up? ), fresh lime juice, peaches (fresh or frozen), water, granulated sugar and ice. First thing you’ll want to do is make a simple syrup. Add 1/2 cup boiling water to a 1/2 cup sugar. Stir until dissolved and let cool. Puree 1-1/2 cups raspberries (6 ounces) with 2 Tablespoons of simple syrup. Pour the puree into a separate container and rinse the blender. Dip the rims of your martini glasses into fresh lime juice and dip each glass in coarse sugar. Pour a little of the raspberry puree into each glass, then top with the peach mixture. Funny how a little party-favor in your drink makes you feel giddy! Do you see the sparkly-sugar on the rim? Don’t leave that part out. And here’s another virtual cocktail napkin for you. I know you’ve been waiting for a new one. Dip the rims of 6-8 martini glasses (depending on the size) in fresh lime juice and coarse sugar. Add boiling water and sugar to a pouring vessel, stirring until sugar dissolves. Puree raspberries and 2 Tablespoons of the simple syrup in a blender. Pour into a small bowl and rinse the blender. Blend rum, fresh lime juice, the remaining simple syrup, peaches and ice until smooth. 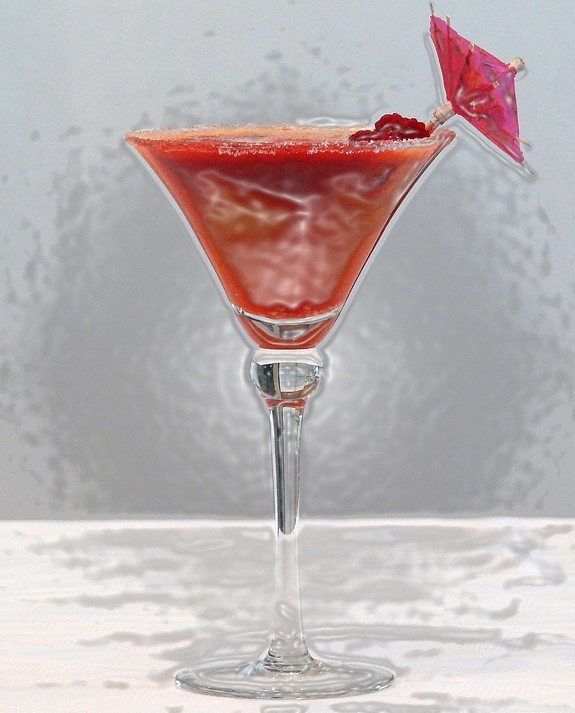 To serve, pour a small amount of the raspberry puree into each martini glass and top off with the peach mixture. Drop in raspberries for garnish. Oooh, I love those photos. And peaches. And cocktails. To summarise: you’ve got a fan XD. If it ever warms up here I’ll be making these bad boys! Fuzzy Yum! I thank you from the bottom of my heart for not posting this a week ago because I would have cried and cried and cried because my still pregnant self would not have been able to make this drink in the late afternoon. But TODAY I CAN and I am soooooo excited! Oh, honey, my mouth is watering now!!!! I wonder if that counts as a breakfast shake? Maybe a little protein powder? Peaches and raspberries together in a cocktail definitely make it a winner! that looks delish–i adore the mini-umbrella!!! your pictures are making me thirsty, but it’s 9am and a tad early for a cocktail. 🙂 i’ll wait until 9:30. These are almost too pretty to drink! This looks fabulous! I love a good peach bellini, I wonder how your Fuzzy Melba would be with sparkling wine instead of rum…. And yes, it gets hot in Upstate New York, but it’s not the heat that will kill you, it’s the humidity! A pitcher of those please, thank you kindly! What – oh yes, it’s for one person! OK OK, add a super big crazy straw! —fab pics, love even the photo glammer shot you added on the last pic! Imm make a mango one sine I have 4 large ones I don’t want to go to waste! mmm…a couple of these and you won’t be feeling the heat. You had me at hello. There is nothing wrong with that drink, as far as I can tell. Of course, I will need to test it out to make sure. Looks like a really fun drink recipe. I just cleaned out my pantry and threw out a bunch of those little umbrellas. Now why on earth did I do that?? Mmmm…those looks just heavenly. Ohhh how I would love one right now, poolside. I WILL be making these!! Possibly tonight if I can get to the store in time. I’ll have to take a night off the limoncellos and have a peach break! I love your pictures, looks so yummy! Gulp! Mouthwateringly delicious. Bad piggy, bad – it’s turning towards 5pm here; down tools and get experimenting with these tastes. Thanks – you perked up my day. Wow. Just wow. You’ve got the best drinks. Party at Noble Pig’s! I froze the raspberries that I picked. It doesn’t look like you sifted (is that the correct word?) raspberry puree, so I could just use the frozen stuff. I’m with you on peach season. It’s just starting – so I have to get my peach fill in before it goes back to mushy or grainy, flavourless peaches. After enjoying a serious glut of frozen cocktails while beaching it over the past few weeks…and now THIS…I am so buying a new heavy duty blender in the next few days. The temptation is just too great! “Melba” always reminds me of melba toasts. Maybe melba toasts with Fontina would go well with a Fuzzy Melba. I am currently drowning in drool. Seriously, that looks like frozen heaven! YUM! and that’s saying a lot because I am severely anti fruity drinks. Boy, does that ever look refreshing! Maybe this afternoon I can whip this up. But if not, soon, very soon. Those are gorgeous! I’ve got to add them to my drink repertoire. I like keeping small quantities of drink ingredients in the freezer so I can have something exotic at a moment’s notice. This recipe looks like it would adapt to my approach quite nicely. Loved the tomato pie this weekend, BTW! WOW – Yum – You put us all to shame!! What a perfect summer drink for all us peoples where the temp is pushing 100. Those are so pretty! They look like a Belini! Perfect for us fruity-rum-drink kind of girls! oooh… ahh… and it’s pretty to boot! I just discovered this weekend that we (apparently) grow peaches right here in the MidWest, so I’m stoked! Local fuzzies!! Oh WoW! I like this so much that I’m on my way to get spiced rum and rasberries & peaches so that I can have one waiting for Mr. Snooty when he comes home from the office. If you keep making these delicious looking drinks I am going become an alcoholic. Looks so refreshing! That looks good! I like the use of the fresh peaches and raspberries. cathy. this is an amazing drink. amazing. really, great entry–i’ve never wanted to get liquored up so badly before. But I’m gonna go with sinful and make it this weekend. I’m gonna have to pick up the ingredients for this the next time I’m at the store. It looks too good to pass up. my mouth is totally watering. you are a wicked, wicked woman! I -love- it! Now all I have to do is figure out how to make this without the rum. cathy that’s beautiful! i’m hoping you can make this with frozen rasperries?? i would love to make this for our Christmas party!! This sounds awesome! I plan to make it tonight. Gorgeous and amazing pictures are making me really hungry (thirsty?)! This looks like an excellent stress-buster after a long day of dealing with humans. I’ll be knee deep in one come Thursday night! That sounds like my kind of drink. I will definitely have to try it. I’d like to order a beach, beach lounge chair, 85 degrees with no humidity and at least 3 of those! Is it just me or is your photography getting better almost daily? I mean, it was always good. But this is better. And the drink looks fantastic. Thanks for sharing, Cathy! it was 112 here today. Cathy, do you deliver??? I want one of those….NOW!!! I like the photo technique used on the last photo..v-cool…drink too! Yep, you’ve done it again. My next cocktail party is at your house! Mercy. Thank goodness I’m done trining for my “big event” of the summer. Methinks I am going to need to get this recipe going reeeeeal soon. Oh, I am definitely going shopping today. I have been studying for finals so I am playing a bit of catch-up and these yummy looking, healthy for me drinks caught my eye. I am salivating on my computer at 8:45 in the morning. This will be my celebrating drink when finals are done tomorrow. Thanks!! These are gorgeous. Can I come over, pretty please?!? Ooh, this looks like a perfect gardening/watching the kid splash in the pool drink 🙂 Or lunch. Such a sinful looking drink! Spiced rum and berries? I’m so there! And there would be heaven. Noice! Definitely more appetizing than the last cocktail I tried to make for my husband. I love the colors and the flavors, and…well, what’s not to love? Always up for a tasty summer drink! Love the look of them too! Mmmm…I love fuzzy navels – These look fantastic! You are WICKED…well, these drinks are Wicked…you are HELLA cool. That drink is almost too pretty to drink. Yeah right, like that would stop me from dipping in. YUM, YUM, YUM! Oh what I would do for a fuzzy Melba right now! They look fantastic. It’s indeed a classy cocktail! Lovely! Wonderful pictures. I wish mine were half as good as yours. I hope you realize I took that last photo and am using it as my desktop photo today. I SOOOO need that right now! According to my monitoring, millions of people on our planet get the home loans from different creditors. So, there’s good chances to find a credit loan in all countries.